Polar Vortices in Oxide Superlattices: Cross-sectional high-resolution STEM image with an overlay of the polar displacement vectors (P indicated by yellow arrows) for a (SrTiO<sub>3</sub>)<sub>10</sub>/(PbTiO<sub>3</sub>)<sub>10</sub> superlattice, showing that an array of vortex-antivortex pairs is present in each PbTiO<sub>3</sub> layer. b, A magnified image of a single vortex-antivortex pair. c, The curl of the polar displacement (∇ × P) for the same vortex-antivortex pair reveals the alternating rotation directions of the structures. d, Polarization vectors from a phase-field simulation of the same (SrTiO<sub>3</sub>)<sub>10</sub>/(PbTiO<sub>3</sub>)<sub>10</sub> superlattice, which predicts vortex-antivortex pairs that closely match the experimental observations. Nature (2016). A. K. Yadav, C. T. Nelson, S. L. Hsu, Z. Hong, J. D. Clarkson, C. M. Schlepüetz, A. R. Damodaran, P. Shafer, E. Arenholz, L. R. Dedon, A. Vishwanath, A. M. Minor, L. Q. Chen, J. F. Scott, L. W. Martin, and R. Ramesh, University of California, Berkeley, Pennsylvania State University, Lawrence Berkeley Laboratory, Argonne National Laboratory, University of St. Andrews. The complex interplay of spin, charge, orbital and lattice degrees of freedom supports exotic physical phenomena. In recent years, complex spin topologies have emerged as a consequence of the electronic band structure and the interplay between spin and spin–orbit coupling. 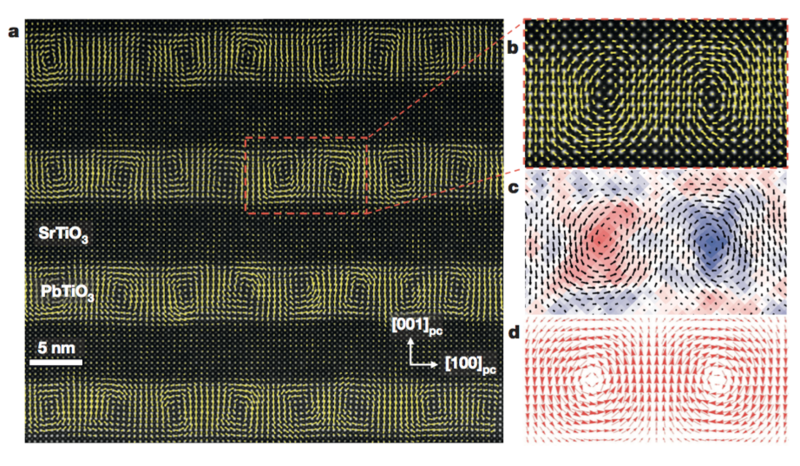 Here we produce complex topologies of electrical polarization—nanometre-scale vortex–antivortex arrays that are reminiscent of rotational spin topologies—by making use of the competition between charge, orbital and lattice degrees of freedom in superlattices of alternating lead titanate and strontium titanate. Atomic-scale mapping of the polar atomic displacements by scanning transmission electron microscopy reveals the presence of long-range ordered vortex–antivortex arrays that exhibit nearly continuous polarization rotation. Phase-field modelling confirms that the vortex array is the low-energy state for a range of superlattice periods. These observations have implications for the creation of new states of matter (such as dipolar skyrmions, hedgehog states) and associated phenomena in ferroic materials, such as electrically controllable chirality.